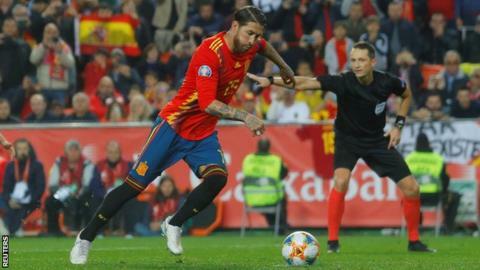 Captain Sergio Ramos scored his 16th goal of the season - and his fifth chipped penalty - as Spain edged past Norway in their opening Euro 2020 qualifying game. Defender Ramos converted a 'Panenka' style spot-kick for the winning goal. Former Bolton loanee Rodrigo scored the opener on his home ground in Valencia, before Bournemouth's Joshua King equalised with a penalty for Norway. But he did earn Spain's penalty when tripped in the box by Norway goalkeeper Rune Jarstein, allowing Real Madrid centre-back Ramos to step up and dink in his 10th penalty of the season to take his tally to 90 career goals. Second Half ends, Spain 2, Norway 1. Offside, Norway. Joshua King tries a through ball, but Bjørn Johnsen is caught offside. Delay in match Sergio Ramos (Spain) because of an injury. Delay in match Bjørn Johnsen (Norway) because of an injury. Sergio Busquets (Spain) wins a free kick in the defensive half. Foul by Bjørn Johnsen (Norway). Corner, Norway. Conceded by Sergio Canales. Rodrigo (Spain) wins a free kick in the defensive half. Attempt missed. Marco Asensio (Spain) left footed shot from the centre of the box is just a bit too high. Assisted by Sergio Canales with a through ball. Foul by Joshua King (Norway). Substitution, Spain. Jaime Mata replaces Álvaro Morata. Jordi Alba (Spain) wins a free kick in the defensive half. Mohamed Elyounoussi (Norway) wins a free kick on the left wing. Corner, Spain. Conceded by Kristoffer Ajer. Attempt blocked. Rodrigo Moreno (Spain) left footed shot from outside the box is blocked. Assisted by Jesús Navas. Offside, Norway. Mohamed Elyounoussi tries a through ball, but Bjørn Johnsen is caught offside. Attempt saved. Marco Asensio (Spain) left footed shot from the left side of the box is saved in the bottom left corner. Assisted by Rodrigo Moreno. Corner, Spain. Conceded by Ola Kamara. Attempt missed. Mohamed Elyounoussi (Norway) right footed shot from a difficult angle and long range on the left is close, but misses to the left from a direct free kick. Substitution, Norway. Ola Kamara replaces Stefan Johansen. Substitution, Spain. Rodrigo replaces Daniel Parejo. Bjørn Johnsen (Norway) is shown the yellow card for a bad foul. Substitution, Spain. Sergio Canales replaces Dani Ceballos. Attempt missed. Rodrigo Moreno (Spain) left footed shot from the centre of the box is high and wide to the left. Assisted by Dani Ceballos. Goal! Spain 2, Norway 1. Sergio Ramos (Spain) converts the penalty with a right footed shot to the high centre of the goal. Penalty Spain. Álvaro Morata draws a foul in the penalty area. Penalty conceded by Rune Jarstein (Norway) after a foul in the penalty area. Foul by Kristoffer Ajer (Norway).